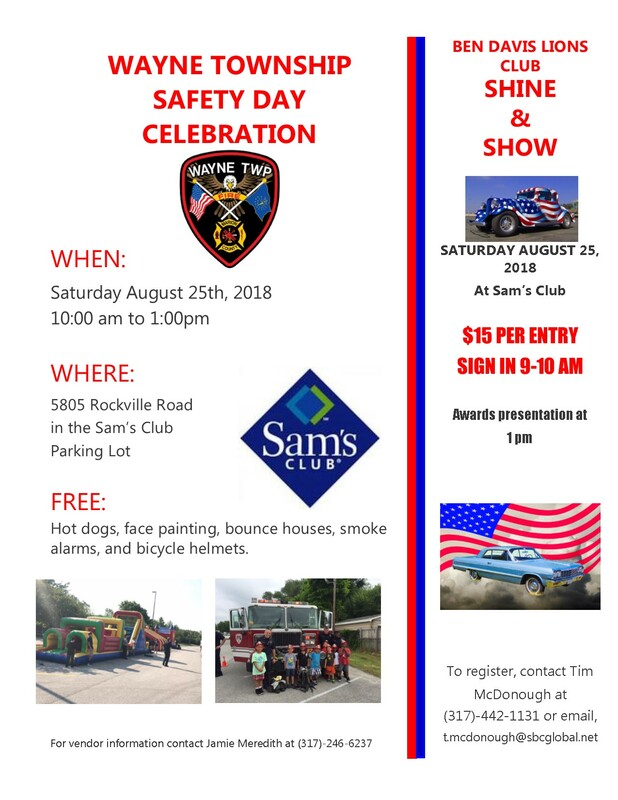 The annual Wayne Township Safety Day Celebration will be taking place on August 25th (next Saturday) from 10:00 a.m. – 1 p.m. in the Sam’s Club Parking Lot located 5805 Rockville Road. This is a great chance to come out and see safety equipment up close, visit a lot of booths that have information about many services in not only Wayne Township, but also in the County, and have a hot dog. There will also be activities for the children including face painting, bounce houses, and bicycle helmets (while they last). If you need a smoke alarm, those will be given away as well. In addition to the Safety Day, Ben Davis Lions Club is having a “Shine and Show” that day at Sam’s Club. Great opportunity to come out and see some classic vehicles. For more information on this event and also how to participate with a booth or enter the “Shine and Show”, please see the attached flyer. Hope to see many of you there!